We were asked to make this special waistcoat for a customer for his wedding. Special, of course, because it was his wedding, but special too because of the colour and the piping. The colour looks fantastic and the piping, all worked by hand and very hard to do, brings it to life very elegantly. It compliments the morning suit beautifully. Made and cut in London. As with every waistcoat we make, unless you choose our Express service, the waistcoat will take 8-9 weeks to make – we have a half way baste fitting and then a forward baste fitting before the waistcoat is finished and delivered. This is a pure wool from a mill in Yorkshire. We have a huge range of cloths to choose from – including wools, cottons, silks and linen’s….and colours too! 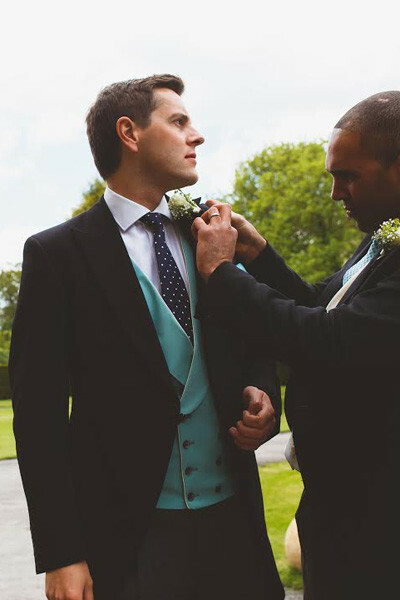 A Fitting Occasion - Bespoke Suits By Savile Row Tailors.